As our art community has grown I’ve met so many wonderful artists and photographers embracing the new tools and techniques—and seen such beautiful artwork! One of my favorite things about traveling, speaking, and writing is meeting wonderful new people who have all sorts of different experiences and skill levels in the world of traditional art and digital imaging. I’m really pleased you've found this site! I want the site to be something you can immediately use and enjoy. There are many different things to see. You'll find articles I've written and that others have written about me, the latest information on my books, links to artists and other resources, and of course, my own art galleries and professional services galleries. Happy Painting! The Photoshop and Painter Artist Tablet Book, Second Edition! The Photoshop and Painter Artist Tablet Book: Creative Techniques in Digital Painting using Wacom and the iPad, Second Edition is a one-on-one art class with Cher in book form. The book focuses on traditional artist theory, and creative techniques using traditional media practice, Adobe Photoshop CS6 and later, Painter X3 and later, Wacom Intuos5 and Intuos Pro Tablet family, the iPad, and more! As much art book as guide, The Photoshop and Painter Artist Tablet Book: Creative Techniques in Digital Painting using Wacom and the iPad, Second Edition uses traditional drawing and painting theory exercises, coupled with real-life projects, to show readers how they can use Painter and Photoshop with pressure-sensitive tablets to draw and paint with a computer. 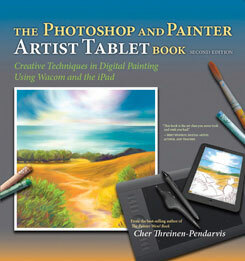 In this gorgeous, large format, full-color book, award-winning artist and author Cher Threinen-Pendarvis takes readers through a variety of projects designed to improve their drawing, composition, and conceptual thought processes while exploring different uses of the many brushes available in Painter and Photoshop. Readers will benefit from Cher’s creative thought processes and composition design secrets that she uses in her own work, but all the concepts, processes, and projects in this book can be applied to readers’ own drawings and paintings. Through step-by-step lessons, Cher shows readers how to set up a pressure-sensitive tablet and stylus; use the iPad for sketching out ideas and use related software such as Brushes, Art Studio, and Adobe Ideas; use mark-making tools in Photoshop and Painter; create tonal, gestural, and contour drawings with a pressure-sensitive tablet and stylus; incorporate scanned artwork into digital paintings; use photos as a reference for the illustrations; make creative use of color and ideas for composition design; translate traditional color theory to digital color tools; simulate canvas and paper; create mixed media; and more. 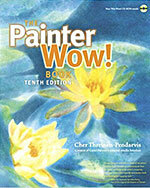 The 10th Edition of The Painter WOW! Book series is out. Extensive new artists galleries, tutorials and a thorough editing to reflect new changes to Painter 12 make The Painter WOW! Book educational and inspiring! 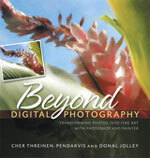 By Cher Threinen-Pendarvis and Donal Jolley, Beyond Digital Photography takes intermediate and advanced Painter and Photoshop users on a journey of artistic expression. Many different techniques developed by the authors are carefully documented in this very first book of its kind. ©Cher Threinen-Pendarvis. All Rights Reserved.